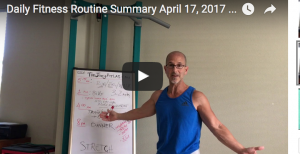 In this segment of “Whiteboard Walk-through” I give you today’s simple fitness highlights, variations you can consider yourself, and ways to get things going in the right direction, ASAP. You have to admit – that is a little funny… Fired Up at 50! No matter which way you try to excuse yourself, it’s simply a choice. We all make it. A few make it in favor of a life well lived – and most others make the choice in favor of self neglect, self abuse and slow self destruction… In essence, “slow suicide”. So, I recorded yet another daily fitness summary to give you an overview of how some of my days are structured in order to maintain the levels of health and fitness I value. 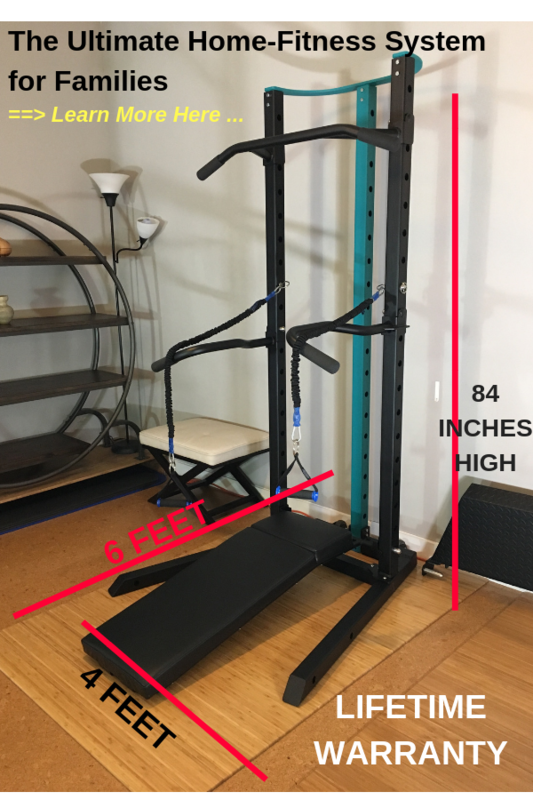 This is a simple example that anyone can follow, no matter your age or your fitness level, to create your own daily habit system, that can be flexible from day to day and shift when needed. Bottom Line: Would more of these each week be helpful to you in some way? Would adding more to them be even more helpful? If so – what would like me to add? Can you use some daily fitness inspiration and fuel for motivation a few times a week? Ultimately you’ll want to listen to what is being shared, as we each reveal personal evolutions, client breakthroughs and fitness evolutions that will surely inspire you and fuel your personal motivation for positive, life-improving action, in ALL areas of LIFE. And please do use these ‘easy’ buttons to share today’s video with anyone you wish, no matter where they are in the world. The more people we reach the more we can help. You never know who’s life you will positively impact by a simple sharing gesture of something good. Now, while this may look “too easy” as MCM talks me through it… Just imagine the full 16 station sequence being followed one after the other… Gentle, yes – but “too easy”, no. Bottom line is this: When you know what you’re doing, when you TRULY understand the human body and mind, you can get incredibly fit and healthy in a way that is enjoyable, effective and doable FOR LIFE. While one might be able to get away with that kind of stuff in the younger years – it all catches up to you, and the need to change is inevitable. So why not start on the right path in the first place? The conversation is congruent with our “body-mind” approach to fitness and wellness, and gives you a deeper sense of your own potential that you may not have been aware of, or didn’t believe you could achieve. Listen and be enlightened to the enhanced version of you that is dormant inside you, waiting to be ignited, empowered and unleashed – NO MATTER YOUR AGE. You probably know at least one person who NEEDS this message today, maybe a few people. So do good for the world and use these easy share buttons to help someone you know. The majority of people being out of shape, depressed, in pain, aging pre-maturely, and flat out UNHEALTHY – is no accident. It’s a result of collective mindset, societal norms of laziness and commonly accepted, default modern behaviors that steer away from consistent physical activity and healthy eating habits…. As this episode is focused on “Awareness”, which is Step 1 – I will be adding a few more episodes on the subject, in addition to adding a few blog posts going even deeper into the various layers of the Matrix of Negativity. When I speak of the layers – in the most basic sense, I’m referring to the elements of negativity that are subconscious and conscious. For example, conscious can refer to someone premeditating an action against a friend or loved one, to undermine their positive efforts of self-improvement. That’s a very basic, short-hand summary of the topic. And for today’s purpose, it should suffice to set the stage for deeper delves into the various aspects of Negativity so that you can identify it, isolate it – and then create your powerful action plan to conquer it – and replace it with your Matrix of Positivity. As always, I’d love to hear your thoughts, comments or questions below. Whatever is on your mind – I want to hear it… Just use the box below. And don’t forget to share this video and page by using the ‘easy’ buttons below… You never know whose life you will change with one simple gesture of positivity. Any questions, comments, thoughts, love or praise? Just post it in the comment box below and I’ll reply in a bit. You know I love hearing from you. It might be a keeper for these quick dinner videos. Eating right is one of the BIGGEST (mental) challenges for most people trying to follow the fitness path for the benefits of health, high quality of life, wellness and longevity. This video shows another example of how simple “eating right” can be. WARNING: My “one arm videography” skills were a little off on this one, but the info is still solid. In this video, I was battling the timing of having my daughter and her friend barreling down the stairs for dinner. So I was aiming to shoot it before the distractions – and got it done! Questions, comments, thoughts?? Post below, I’d love to hear from you.